Participants (excluding invited speakers) are requested to submit a title and abstract (max 1 page) to mi20@imperial.ac.uk. Submissions will be judged for relevance to the workshop. Those accepted will be posted at the conference web site and each paper will be allowed a short presentation and also a poster at the conference. Please note that the final submissions (for accepted abstracts) should be prepared according to the following formatting instruction. Authors of all accepted abstracts are requested to submit a revised / extended abstract (max 3 pages) which will be made available from the workshop website. Please make sure that you will send your final submission (including all source files) to mi20@imperial.ac.uk before the deadline of 30th September 2016. 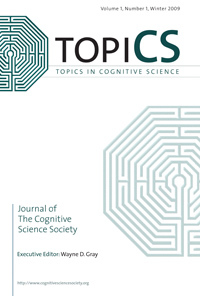 Selected papers from invited speakers will appear in a special issue of the Topics in Cognitive Science journal.